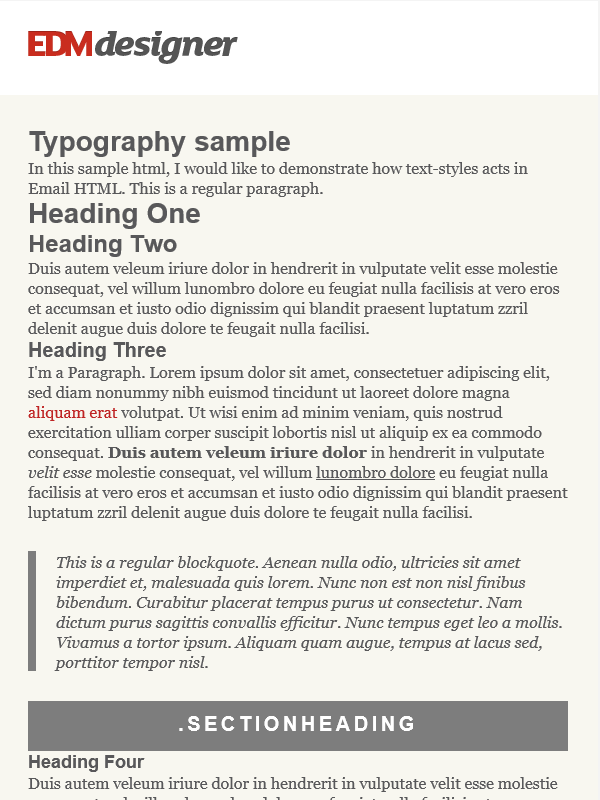 In the last few weeks, we went through the main principles and limitations of HTML Emails. 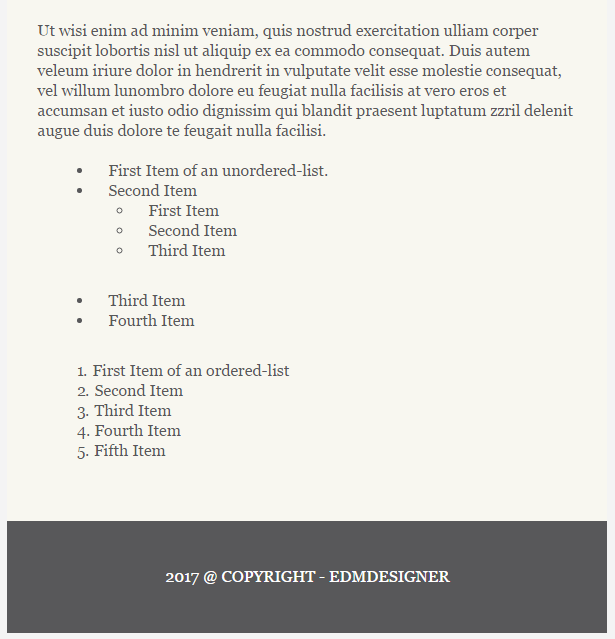 We saw new techniques on layout design, email width limitation and bulletproof buttons. 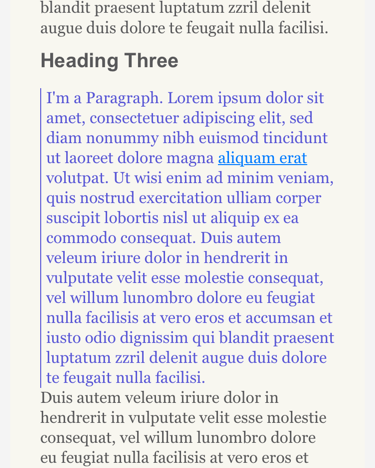 In this article we cover text formatting properties and how we can best use them. This is the 9th article in our tutorial series, where we explore typography-related options and opportunities. We are mainly focusing on the technical aspects of typography now. 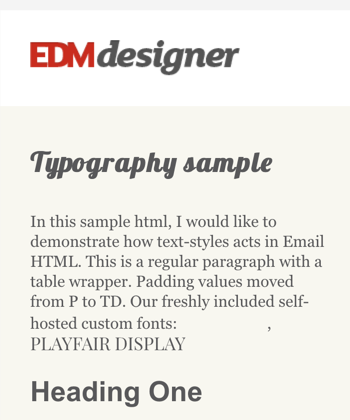 Our main goal is to build a proper email template, which will look the same in the majority of the email clients. 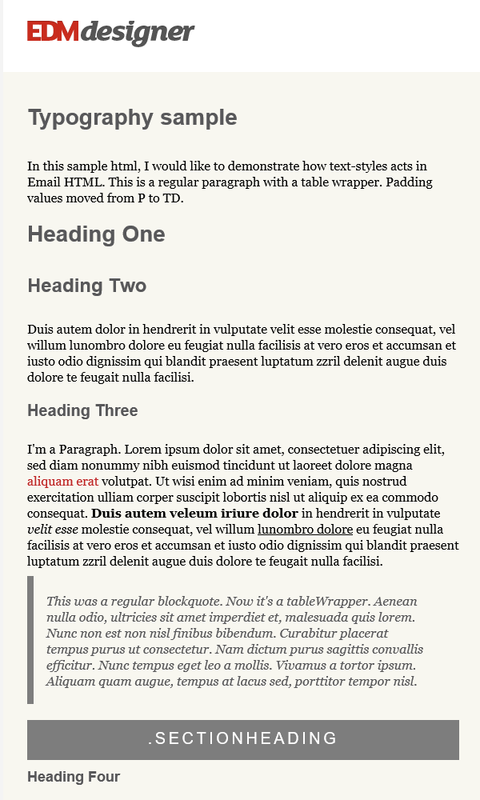 Additionally, we dive into related areas for progressive enhancements, like custom fonts included from Google Fonts. In the following subsections, we're going over the pitfalls related to typography. We want to achieve a pretty, uniform look in all email clients. 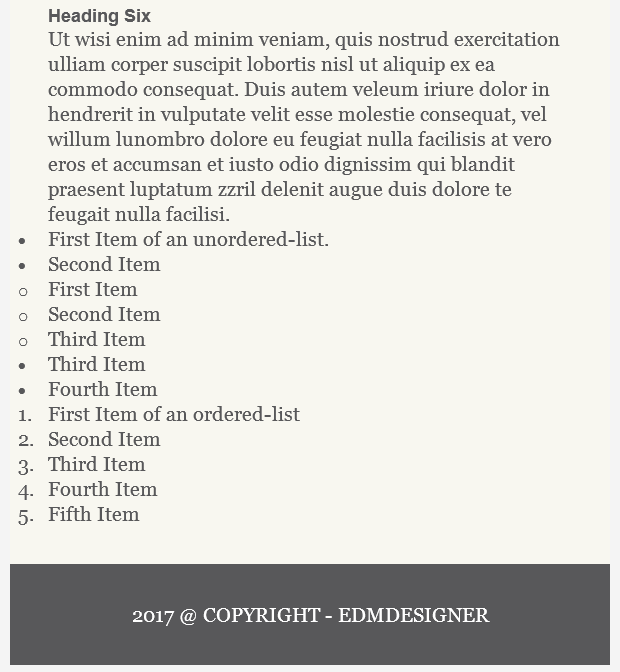 First, we need a clean and simple initial template, so we picked a template from the previous tutorials that is hopefully already familiar to you. 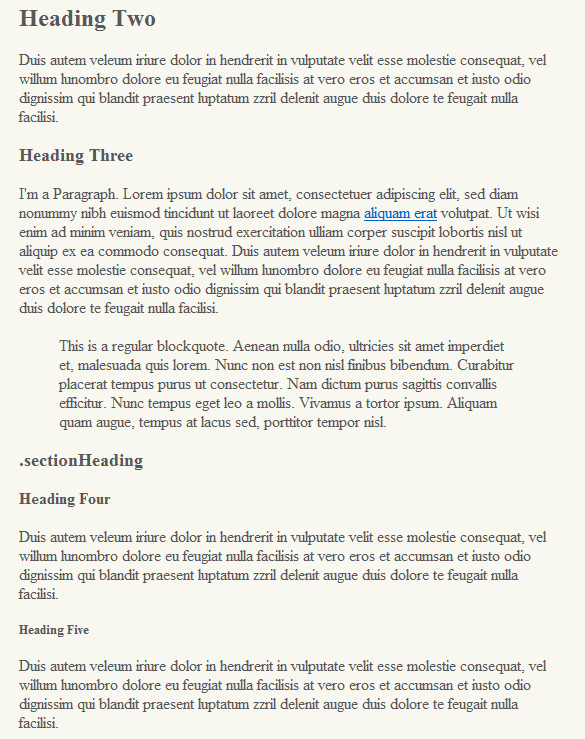 It's a single-column layout, where we insert the most common, and mature HTML tags. In typography, they are called text-related semantic tags. We call an HTML tag semantic when the tag itself refers to the content. For example the p tag refers to a paragraph, while h1-h6 refer to heading elements with different importance. Without exhausting the topic too much, we pick a few very common tags to create the initial HTML content. You can find out more on semantic HTML and its importance in the following article. As you can see in the Litmus test, there are differences among the clients in how they show the content. The styles in the head element (later referred as "head styles") do their job on modern clients, like Apple desktop devices and some webmail clients. In other email clients they are not used. There are still many email clients that don't support styles in the head. We defined CSS reset properties in a previous tutorial of this series. They set the CSS values explicitly to a default value, usually to zero. If we provide styling for these elements later in inline styles, they will look the same in every email client that recognizes our styles. This is necessary if we want to achieve a uniform look. The example below showcases that some elements are missing in Apple Mail compared to Comcast. At the moment this is the desired behavior. 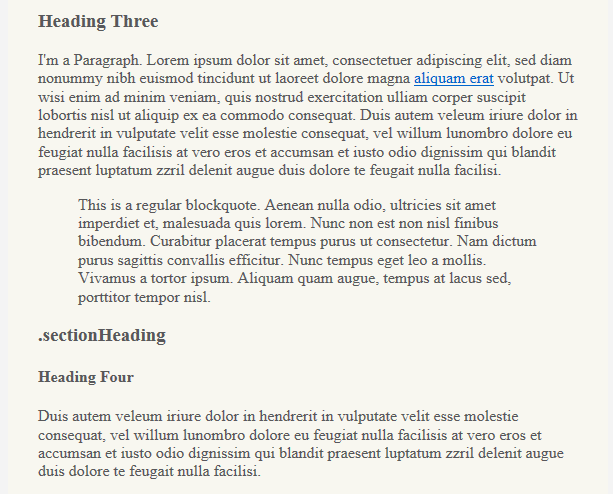 The reason for this is that we skipped adding styles for the blockquote and some heading and list tags. Therefore, modern clients hide these contents, as the CSS resets from the head are applied. 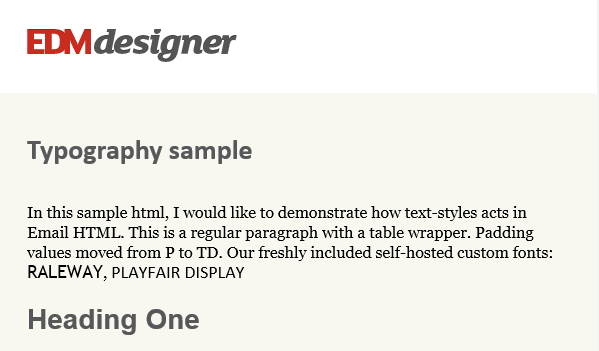 All the clients which don't support style tags use their own user agent stylesheets. This means that they apply their built-in default values and show the content. The same thing happens on all Android versions: they show freshly inserted HTML tags, while h3, h4, h5 ,h6, and ul, ol groups show up legible, despite not having a defined font-size. When you examine the Litmus previews or the image above, you will see that the whole paragraph of the link is blue on iPhone 7 and some Apple devices. This strange behavior didn't occur in any of our in-house tests. This is only the result of some test environment inconsistency, so don't get stressed about it! We need to declare some styles for the missing headings, ul and ol groups, and the li elements, so they show up in every email client. Let's define additional CSS for these elements too! 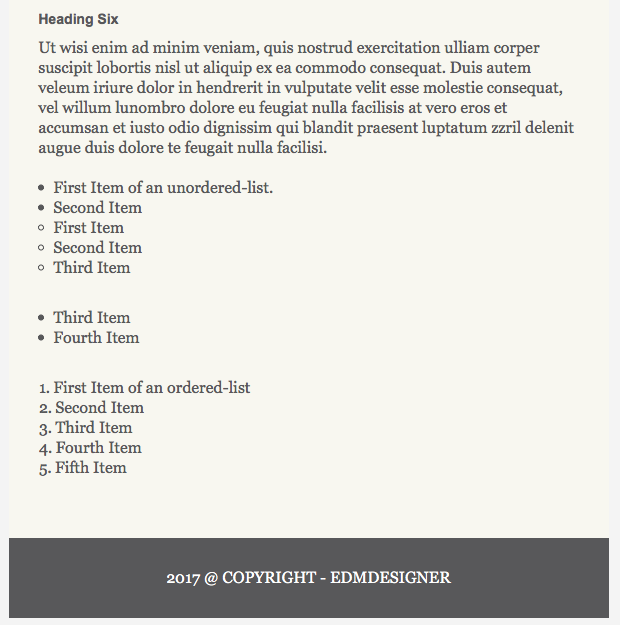 As our initial template had some styles for headings in the <head>, we can define similar rules to make our entire template well-formatted. Do not forget that we have lists and a blockquote that are not styled. 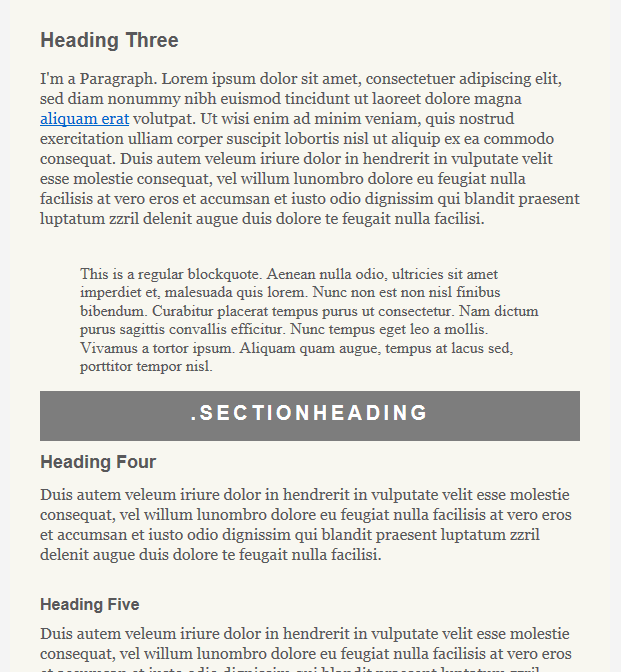 We want to reach a uniform look and feel on all email clients, so we add some CSS for these elements as well. At this point, we want to test an exceptional situation, when a heading element has an inverted look. This means that there is a dark background color, and the heading is light-colored. It often adds value to the design. To achieve this, we use an h3 tag and add a .sectionHeading class to target and identify it. Check out the Litmus test results! Mobile versions are legible, and all similar, so the missing CSS fixed the differences. Here we provided the previews from Email on Acid. They are much closer to what we experience on our own devices. Even though the link tag is styled, it's not consistent in the previews. We'll fix that later in the tutorial. Old Lotus Notes and Word-based Outlooks have major display problems, coming from the clients' strongly limited environment. Here, Thunderbird is included as a reference. These veteran players usually ignore the padding/margin values from the CSS and override properties. We have already added all the necessary CSS styles in the head, but many clients still don't support them. 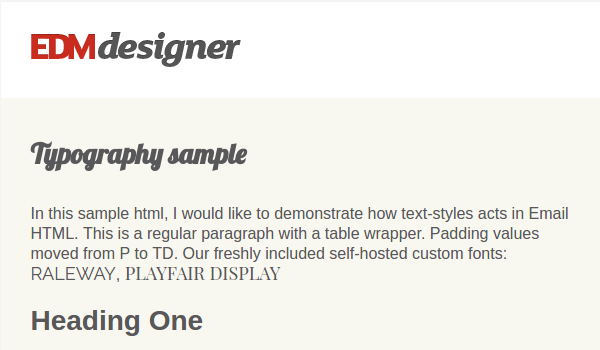 Our main goal is to have proper-looking template in all email clients, so we can't stop here! 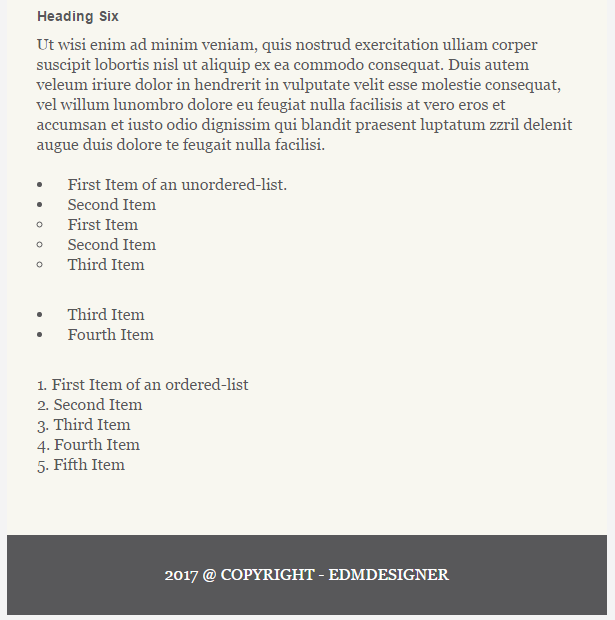 It's not a common technique to define styles in the head for email HTML elements, because it is very fragile. For example Google now supports head styles — on paper. But when it contains any errors, then the whole style tag is stripped out. Inlining CSS, although an ancient technique, can be a good fail-safe. It's time to inline the right styles on text-elements. Let's see what happens! 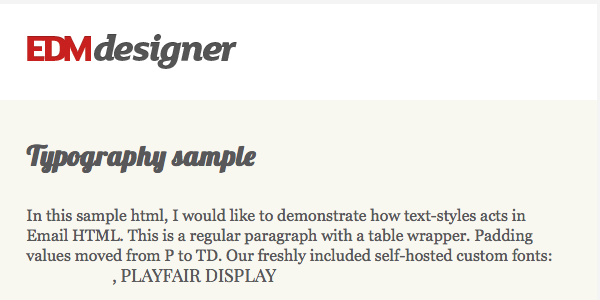 As you can see from the results, inlining helps a lot when an email client strips out the style tag from the HTML. The next step is to use inline styles on links as well. The hyperlink gets a span wrapper, on which we apply a color property so the text keeps the right color, and a text-decoration: none; to remove the underlining. </a> volutpat. Ut wisi enim ad minim veniam, quis nostrud exercitation ulliam corper suscipit lobortis nisl ut aliquip ex ea commodo consequat. <b>Duis autem veleum iriure dolor</b> in hendrerit in vulputate <i>velit esse</i> molestie consequat, vel willum <u>lunombro dolore</u> eu feugiat nulla facilisis at vero eros et accumsan et iusto odio dignissim qui blandit praesent luptatum zzril delenit augue duis dolore te feugait nulla facilisi. As you can see, we set margin properties and list-style-position property in the ul and ol tags and basic font properties in the li tags. Examining these previews we can come to the conclusion that ordered and unordered lists can be quite problematic in email clients, depending on the inherited CSS properties from the client. It's a good trick to use tables for styling lists. We are going to write a mini-post on how to do it, if there is obvious community interest. Please, tell us in the comment section if you find this idea appealing! You may also want for signup to our newsletter so you won't miss it! Anyways, as a rule of thumb, you should always run a thorough test to confirm client support. We are getting closer and closer to a uniform look on email clients, but we're still not to the point we want to reach. Spacing is still inconsistent in Word-based Outlooks. As you can see, there are different limitations of HTML elements across email clients. In general, the longer an element has been a part of the HTML standard, the better support it has. 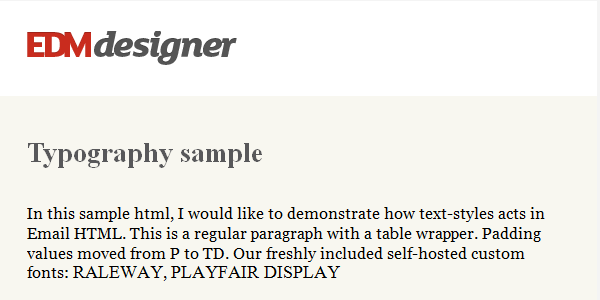 Therefore, the good old table elements and tds are much more widespread in email HTML than, for example, divs. They don't have such limitations either. They can be used easily and consistently to design layout and correct dimensioning mistakes that rendering engines make, when an indefinite situation occurs. You can read on the importance of tables in this community discussion. 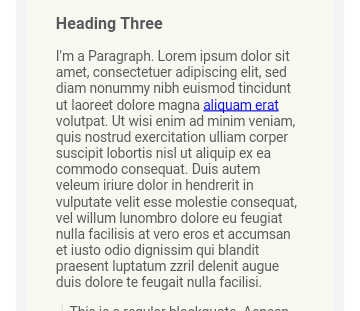 After this pretty lengthy description on the effectiveness of tables, let's apply table wrappers in the heading, paragraph and blockquote elements to fix spacing problems. First we need to reset the CSS properties which are responsible for spacing on semantic text-related elements, and also move the original values to the corresponding wrapper table's td element. 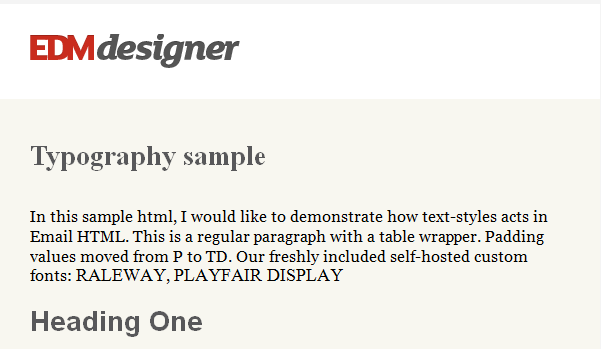 In this new approach, we divide the properties between the table wrapper and the original HTML tag. 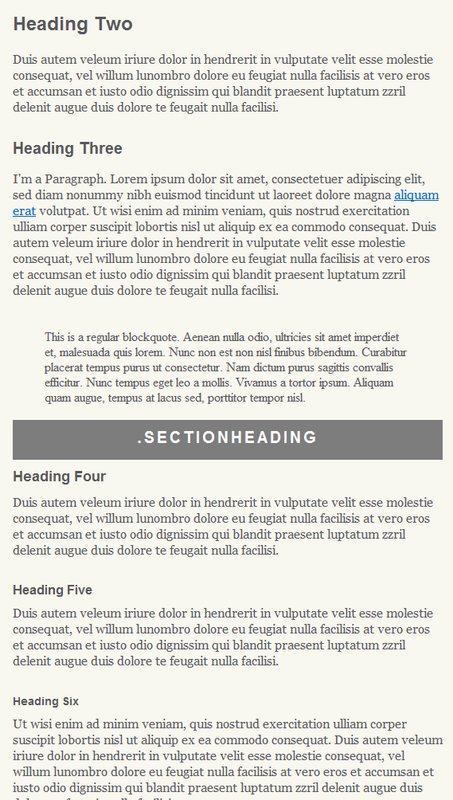 Backgrounds and paddings are moved to the table wrapper, while other text styles remain on the h1. Because we inlined the styles in the previous step, and we still have all the styles inline, we can delete the styles from the head. It's also necessary to do something similar with our section heading. The only difference is that we also add background-color to the wrapper table's cell. 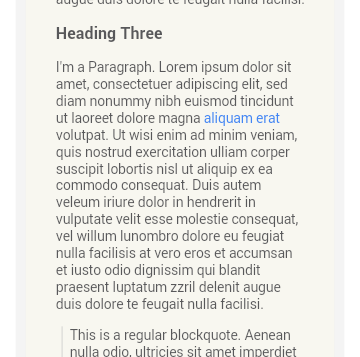 The blockquote element is a little bit different. Usually it has different default styles on each client. Sometimes these properties are so deeply hardcoded that we are not able to fully reset it. So to avoid the border issue below on Gmail App, we replace the blockquote with the tableWrapper. This is a regular blockquote. Aliquam quam augue, tempus at lacus sed, porttitor tempor nisl. This was a regular blockquote. Now it's a tableWrapper. Also this replacement will fix the legacy clients too. You have to be careful with borders. 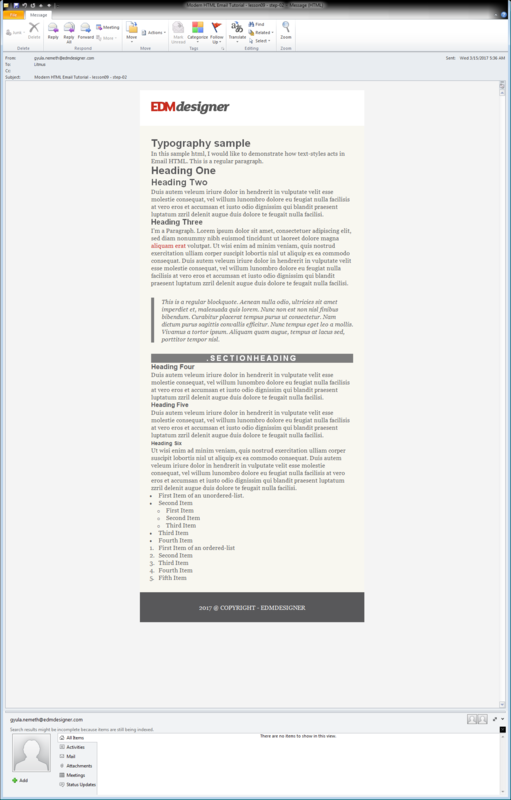 Don't forget that border width is limited to a maximum of 8px in Word-based Outlooks. You can check out the Ultimate Guide of Typography to get a full understanding of the theory. We only share practical experiences and test results in this tutorial. Do not worry if it's still not 100% clear for you! It will make sense, if you look at the full source code on Github. So, let's examine the previews of this step. Also, Word-based Outlooks fail to display the specified fallback font (as in the image above). We'll show you a specific fix towards the end of the article. By default, these Outlooks apply Times New Roman when they encounter a font declaration they don't recognize. 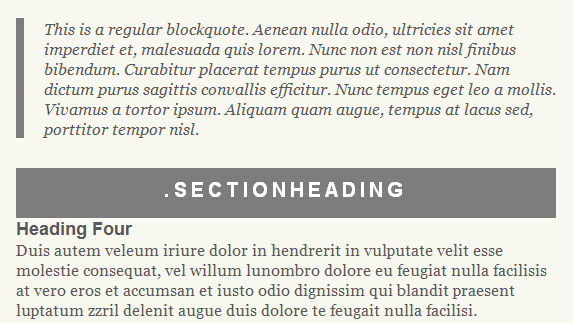 In previous section, we tested custom fonts included with link tags. Let's check the same font includes with @import approach. Comparing the test results from the previous step and this step, we can't see any difference. That could mean that the @import and <link> method has the same support coverage, but when we tested both methods on our own devices, the <link> method performed better. Also, the support changed in the last few years quite frequently, so you should always test your emails, if you want to use custom fonts. If you encounter any differences, or if you have more information on these methods' support, please let us know in the comment section below! By using a conditional statement, we define Arial as the fallback font and with this declaration method, Word-based Outlooks are able to actually adopt it. You can define conditional classes for other web-safe fonts as well, if you wish. 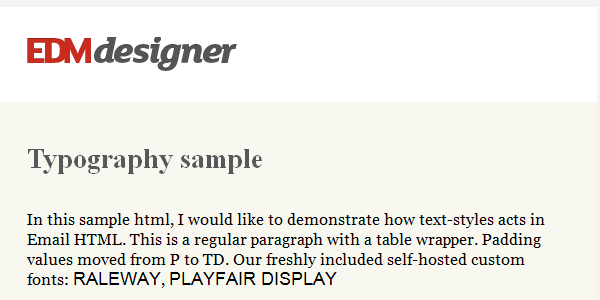 Typography is an essential part of email design. It distinguishes your work and makes your brand recognizable. In this article we started from a basic template with the most common text-related semantic tags. In each subsection we updated the CSS styles and ceased rendering differences — until we had a uniform look with high client support coverage. In the second part, we looked at custom font including, and tested the main methods: the <link> method, the @import method. We saw that these include methods performed equally on Litmus and Email on Acid tests, but the <link> method seemed to be more stable when we tested them on our devices. That is why it's always a good idea to test your emails before you send them. We have also seen a specific fix for Word-based Outlooks to forced them to use our fallback font. I hope you enjoyed this chapter of the Modern HTML Email tutorial series and that you feel more confident about email typography. We will return in two weeks with the next in-depth article. If you don't want to miss it, subscribe to our newsletter!